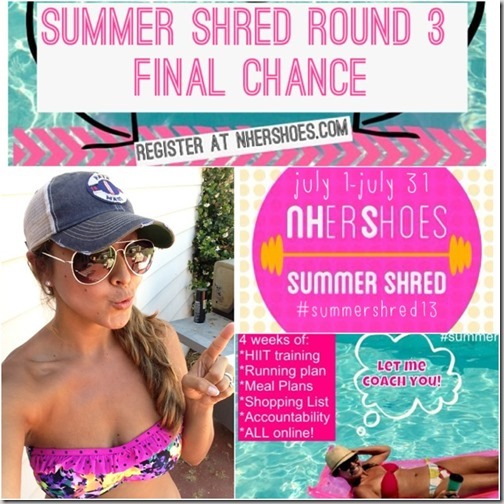 As everyone knows by now, I have been participating in the Summer Shred and Extreme Summer Shred through Bobbi McCormick’s blog NHerShoes. This has been an incredible and life-changing experience for me! I have lost 7 pounds so far and will be measuring my inches in about a week, but I can definitely tell my stomach is smaller and less jiggly, as well as my arms and thighs! The most important part to me, though, is that I feel so much better. My stomach issues have decreased significantly, to the point that I rarely have them (and usually only on those rare occasions when I eat something that isn’t clean), my acne is finally starting to improve, and I feel healthier, stronger and happier. I’ve been doing a lot of research and reading on the foods we eat and their impact on our chances to get cancer, especially since I have the BRCA2 gene mutation, so I already have very high probability of getting cancer in the first place. Everything I am reading places tons of importance on eating a clean diet, staying away from processed foods and refined sugar as much as possible, and avoiding the pesticides and hormones that are on most of the fruits and vegetables we eat (along with in the meat) unless you buy organic. Over the next few weeks, I will be talking more about food and its links to cancer and how I am working to decrease my chances as much as I can. Since I already have an 87% chance of getting breast cancer, why raise that risk even more just to eat unhealthy and not really that good food anyway? I also wanted to let everyone know that Bobbi is hosting one more Summer Shred during the month of July! I cannot express how great these Shreds have been for me and encourage you to look into it! It is only $35 and she provides yummy new meal plans (which I started to mix and match, while adding in my own clean recipes and ones I found online), and awesome, sweat-producing work-outs each week, directly to your mailbox. She also provides lots of tips and strategies for keeping on track and getting back on the horse when you fall off (which we all do sometimes)! Go on over to www.bobbimccormick.com and check it (and her, she’s awesome) now!